About a week ago, Paulo Gabriel from the design web site Abduzeedo.com did a post about Word. For those of you who haven't heard of Abduzeedo, it's a pretty big site in the design world. I was BLOWN AWAY by the response. I don't think I've seen so many Word tweets, had as many new Facebook "likes" or answered so many Word emails in one week. For any of you new Word followers who found my site through the Abduzeedo post and want to keep up with the project (and find out about the occasional free print giveaway), you may want to subscribe to my site RSS or follow me on Facebook or Twitter. Earlier this week, I published a post called "An Idiot's Guide to Reading the Bible," a post I originally wrote for the Pangea blog. (Spoiler alert: I'm the idiot.) It's basically about the origin of Word and the way it's changed how I read the Bible. If you're interested in sharing Word with someone, that post is a great introduction to the project. Sorry for not publishing a new Word post last week! I'm so glad you guys didn't get all Old Testament and demand that I be stoned and cast lots to split up my belongings. Instead you showed some New Testament grace, and I appreciate that. We've been walking through the books of Paul for a while now and it's pretty obvious that this dude is a spiritual giant. He's written about renewing your mind, doing things in love, being persecuted and the seal of the Holy Spirit. When this guy writes, heavenly rainbows shoot out of his quill pen which is made from the horn of a unicorn. In addition to being a good instructor of all things spiritual, Paul also gave great advice on a much more difficult topic... how to get along with other people. I'm more than happy to sacrifice my time and finances and be persecuted for Jesus, but please don't make me hang out with that dude with the big nose. (Full disclosure: I have a larger than average nose.) Y'know that phrase about a person being "so heavenly minded, they're no earthly good?" Paul got that. He wanted to see people grow spiritually, but knew that unless people also knew how to be nice and get along with each other, it was gonna be difficult to grow spiritually. Those things kinda go hand in hand. So you find Paul's letters full of advice on how to be nice, resolve conflicts and just get along with other people. When I read Paul's words about earning the bread you eat, it reaffirmed to me what an amazing communicator that dude was. 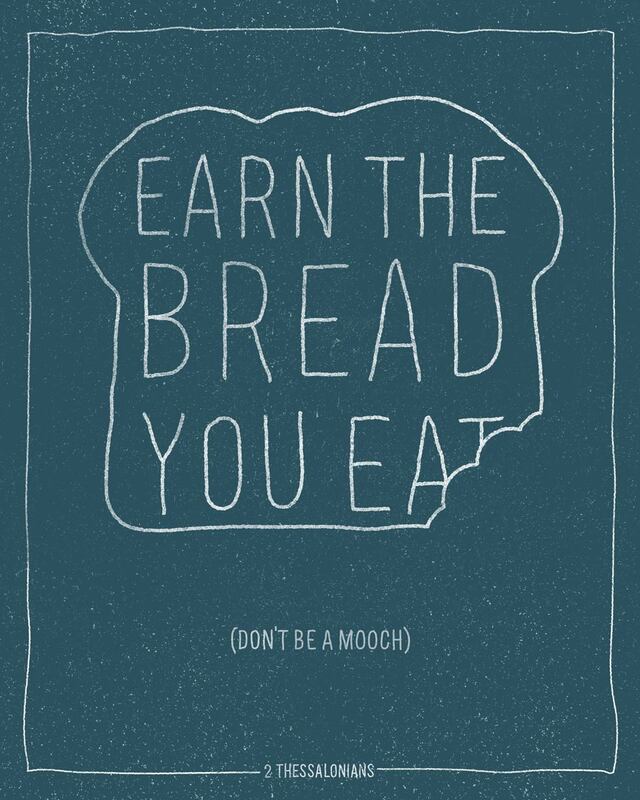 Hypothetically, if I wanted to communicate the idea of not being a mooch, I'd probably spend hours coming up with a design, more time doing a write up with several paragraphs of text and still wouldn't say it as well as Paul did with 5 words about bread. He's wasn't just an apostle, he was an awesomepostle. I don't do this often enough, but I wanted to talk about the design a bit. I've really been digging hand drawn type lately. There's a ton of great designers who are really good at it and a couple of my current favorites are Jessica Hische and Kyle Steed. Make sure to check out their work so you have a better perspective on how lame my attempt is.